Tommy Katsiyiannis battles for the ball. The sophomore midfielder is one of 10 returning starters looking to guide NU to its first winning season since 2014. When Northwestern’s 2017 season ended in a 4-1 loss to Michigan in the Big Ten Tournament quarterfinals, there was sadness and disappointment and the feelings that typically come with the end of a season. But there was also optimism. Nine months after that loss in Ann Arbor, NU is ready to carry that optimism into the 2018 season. Despite graduating five players, the Cats return 10 starters and 21 of their 22 goals – while bringing in one of their top recruiting classes in recent years – as they aim toward their first winning season since 2014. More than a third of NU’s goal-scoring production from last season returns in sophomore midfielder Tommy Katsiyiannis. The Minnesota native finished with seven goals and 31 shots in 2017 and was named to the Big Ten All-Freshman Team. NU will look to Katsiyiannis to create more chances; in 2017, the Cats took only 9.6 shots per game, the second-fewest in the Big Ten against a conference average of 12.03. The Cats must replace forward Elo Ozumba, a striker who fronted NU’s formation from the top despite scoring only 7 career goals. Junior forward Mac Mazzola started the final seven games of the season and finished with 10 points on the year; at six-foot-four, he’s the team’s tallest player, and his size in the box could be an asset on the attack. Another option to fill Ozumba’s shoes is the highly-touted freshman Jose Del Valle. 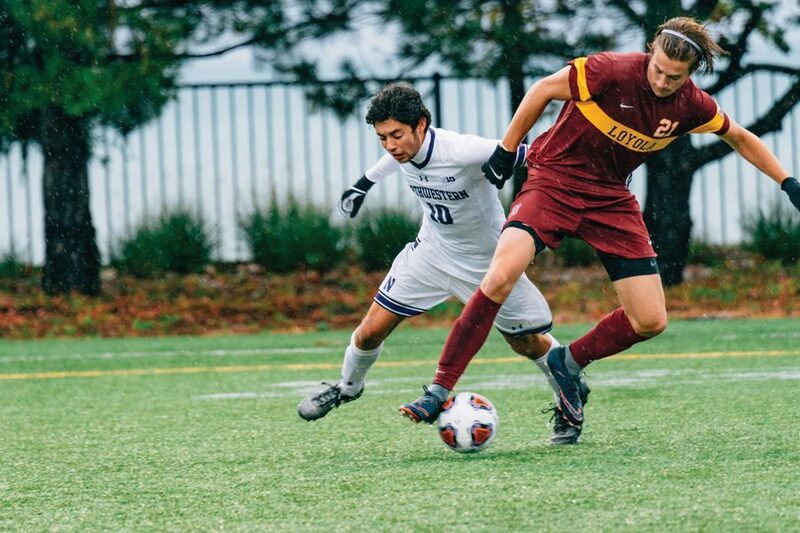 A product of Real Madrid’s academy, Del Valle brings a talented resume to Evanston, including two league championships in Spain and 114 total goals in the past five seasons. Del Valle may take time to adjust to the physicality of American college soccer, but his experience playing in Europe and goal-scoring talent is sure to add a dimension to the Cats’ attack. The presence of two forwards in Mazzola and Del Valle could open up more space in the midfield attack. Junior Sean Lynch, senior Camden Buescher and sophomore Drew Viscomi each scored at least once in 2017, while newcomers like Arizona native Connor McCabe and Chicago Fire academy product Richie Bennett could grow into reliable contributors. Junior Mattias Tomasino also returns, and may be poised for a breakout season. A defensive midfielder, he also saw time in the midfield for the Cats in 2017 and earned quality minutes this summer for Detroit City FC, a fourth-tier semi-professional team. Perhaps the biggest question mark with this year’s squad lie at the outside backs, after the graduation of defender Riley Kelliher. Kelliher and John Moderwell, who will return for his fifth year as a graduate student, started all but three games as a duo last season. Sophomore Garrett Opperman and junior Andrew McLeod will return as center backs, bringing experience to the back line, but NU will need to replace the speed and strength of Kelliher down the right flank to truly be successful. Senior goalkeeper Robbie White will likely claim the starting job in net for the Cats, after splitting time with the now-graduated Francisco Tomasino and now-sophomore Miha Miskovic and finishing the 2017 season with the second-best saves per game (5.50) in the Big Ten. A jump to the top of the conference rankings likely won’t come this season. Four Big Ten teams – last year’s national runner-up Indiana, Michigan State, Wisconsin and Michigan – appeared in the United Soccer Coaches’ Top 25 preseason poll, and five made last year’s NCAA Tournament. An early season non-conference slate including matchups against Xavier – who took a win and a draw off Indiana and Michigan State, respectively, in the preseason – on August 26 and Fordham – an NCAA quarterfinalist in 2017 – on September 3 will give the first glimpse of what this team has to offer. The Cats open their season against Cleveland State at home on August 24. This story was updated on Aug. 25 to reflect John Moderwell’s updated status on the team.